Sometimes the ups and downs of fate can end up making you stronger. 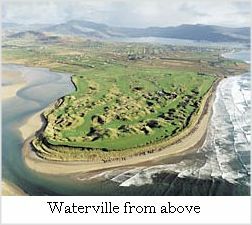 That seems the case with Waterville, a connoisseur’s links on Ballinskellig Bay, just off the Ring of Kerry. After a history that includes the club going out of business some 50 years ago, Waterville today has advantages that few links courses can claim. In fact, several devotees from high in the golfing world claim it’s not only the best course in Ireland, but possibly the world’s premier links. The first course built here was a nine-holer carved out of the landscape sometime in the 1880’s. It was meant to be a diversion for cable company workers on nearby Valentia Island, who trafficked messages back and forth to the United States. After decades of popularity with the locals, Waterville went into decline after World War II, as technology advances cut down the number of cable workers on Valentia. The course actually closed in the 1960’s, living for several years simply as one of the world’s most spectacular unused lots. Enter John Mulcahy, an Irishman who had amassed an absolutely huge fortune in America and returned home in the late sixties to do some rather high profile projects in Ireland (buying gargantuan Ashford Castle and restocking the waters all round Waterville with trout among them). Mulcahy bought the Waterville site and quickly engaged famed course architect Eddie Hackett to build a full-length course there. Hackett, at the peak of his career, was given carte blanch to do whatever necessary to create a course worthy of the stunning site. The course Hackett built, which opened in 1973, has plenty of scenery and the far-away feeling American golfers love (the surrounding area is still quite rural). But it also has the difficulty and pure length that would have been hard to work into an older course. Though the multiple tee placements here give some relief to high handicappers, Waterville places a distinct premium on the long ball. At 7,309 yards total from the back tees, it’s a good 700 yards longer than Ballybunnion or St. Andrews, with a layout meant to test even a professional golfer (Sam Snead called it a “beautiful monster"). It’s an honest, straightforward sort of test, however. There isn’t a single blind shot on the place, the fairways overall are pretty flat and there’s only one real dogleg. It’s also a pleasant walk across a landscape that undulates rather than towers around you. Waterville’s first nine run across the side of the property facing the River Inny, away from the ocean winds. After a relatively straightforward first hole, you confront a 464 par 4 second with a nasty tilt of the fairway that isn’t good for one’s confidence. The third and fourth holes (pars three and four, respectively) both have long stretches of beach just right of the fairways, while the 595 yard long fifth is one of the two longest on the course (the 18th is almost exactly the same length). Besides the variety, you’ll notice something different about the landscape here. Because of the proximity to the Gulf Stream, the weather here is oddly tropical, with palm trees dotting the landscape. “Rugged" is the term most often used to describe the back nine, where you play with the ocean wind howling in your face. The 11th is a 506 yard par 5, with a devilishly narrow fairway and so many dunes covered with high grass you almost wish there were some bunkers to hit into. The most storied hole here is the 17th, a 196 yard par three from a nosebleed-inducing tee 250 feet in the air. On this hole, if you don’t hit the green (or the tiny landing area in front of it) you can count on losing your ball. There’s no fairway to be found on the rolling, criss-crossed dunes in front of the green, and nothing but ocean beach on your right. Say a prayer before you hit here – founder John Mulcahy’s ashes are buried under the tee. Waterville was purchased in 1987 by a group of Irish-Americans from Connecticut. In addition to refurbishing the clubhouse, they recently completed a course upgrade under the direction of star architect Tom Fazio. His various tweaks have added a bit more difficulty to some holes, and helped protect certain parts of the course that were threatened by wave erosion. Waterville’s future seems more protected than it’s past. Its open, peaceful atmosphere feels ancient, but it offers one of the most up-to-date tests of golfing skill you’ll find anywhere on the planet.